Meet our first born Martin. The first born is usually a product of the parents’ experimentation, hahaha! But I’m happy to note that ours turned out well. In fact, I thank him for setting the right example to his two younger brothers. Parenting became easier for us because of him; our younger sons already had a model right in front of them. What warms my heart is that despite being the typical bossy Kuya to his younger sibs sometimes (especially while they were growing up), he sincerely wants them to learn from his triumphs and mistakes, generously sharing what he knows and pushing them to even surpass his own achievements. Thanks Mart. “Woah!, it’s already been three years since my parents cut off my Financial Umbilical Cord* and I’m actually doing good. 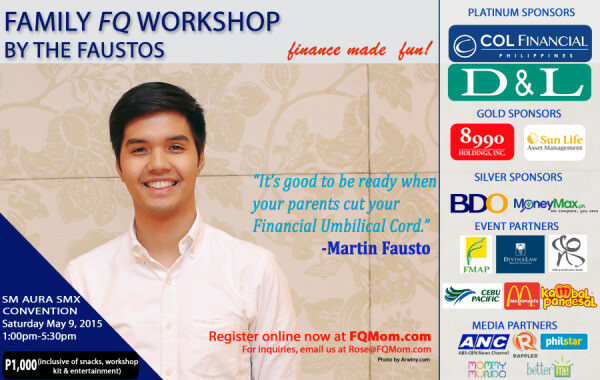 🙂 Regardless of your career, I invite you to attend our Family FQ Workshop on May 9 at SM Aura SMX Convention and and invest in this afternoon of “edu-tainment” where Finance is made fun. Invest in your Financial Independence by logging on to FQMom.com to buy your tickets!